Clarence Harrison - Back to the garage! 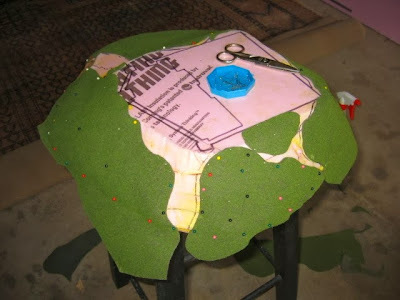 To quickly cover a good portion of the hill with texture, I used irregular shapes cut from a felt-backed grass mat. These mats are obtainable from many model shops and gaming companies. I prefer the felt-backed mats to the more common paper-backed ones because they form better to irregular shapes and hold up better when covered in layers of filler, glue, and paint that comes later. I painted the felt side of the mat with watered down PVA glue and placed the section on the side of the hill. Then I used straight pins raided from my wife's sewing chest to hold the mat tightly in place while it dried. The excess can be trimmed away later with a sharp hobby knife. Instead of using the grass mat, you could resort to textured paint or layers of flocking. I've used all of these methods, but I prefer the mat as I get fast results and it instantly smooths out any imperfections in my layered insulation board. 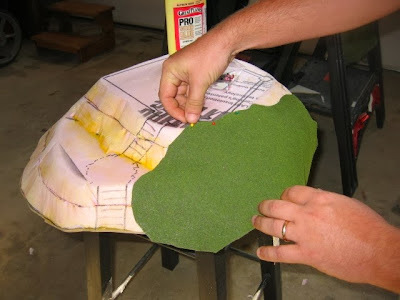 To quickly add texture to the hill, I cut rough shapes from a felt-backed grass mat. These are attached with water-downed PVA glue and held in place with straight pins until it dries. The pins hold the material to the foam until the glue dries. Afterward, I cut off the excess with a sharp hobby knife. The key to making great terrain is to use different layers of textures. I normally work from large to small, meaning I place large boulders and stones first, coarse rubble next, and finally fine texture. 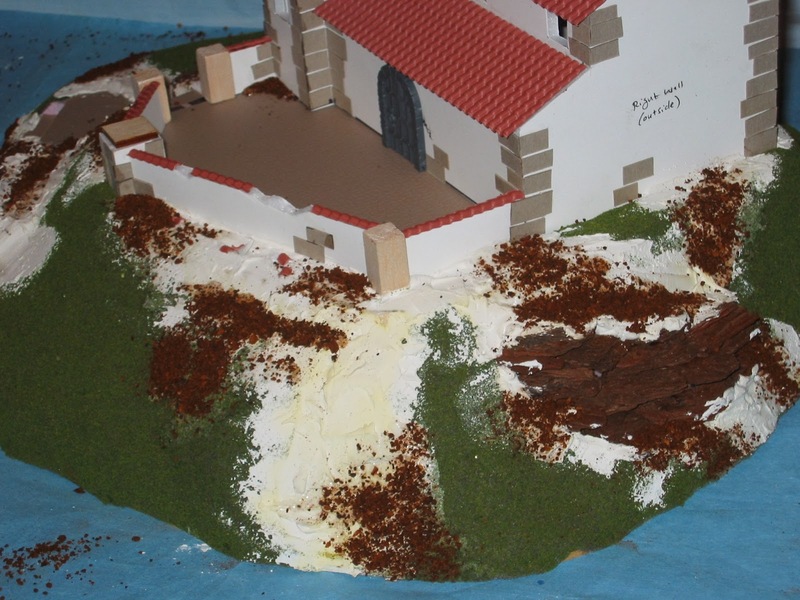 After the grass mat dried and the pins were removed, I glued my building and walls to the hill. Then I set out to add some variety to the hill itself. From the start, I wanted this to be a rocky slope. My favorite material for adding weathered rock to a model layout is pine bark chips! These are available from any home and garden center and when painted offer very realistic results. 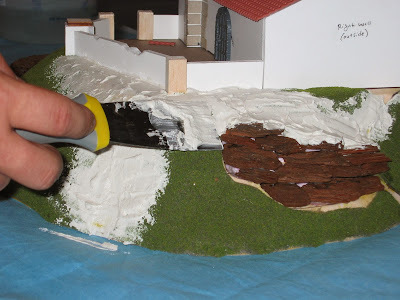 I glued the chips down is layers to look like stepped rock exposed over time. The best tool to use for this is a hot glue gun. White glue will work, but the chips are so light (and hard to weight down), it never seems to form a very good bond. Hot glue dries almost instantly and the end result is very strong. 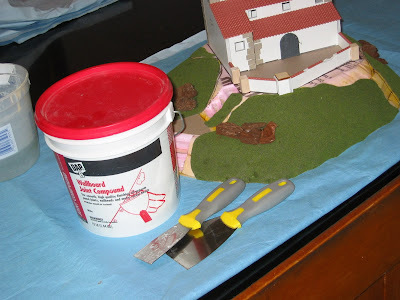 To blend the rocks into the hill and cover the rest of the exposed foam I applied a water-based joint compound with a putty knife and smoothed it out into the grass. Then once again, it was time to let things sit overnight to dry. I used a joint compound filler. Joint compound applied with a spatula blends the "rocks"
into the hill and covers the rest of the exposed foam. is coarse coffee grounds. A can of the stuff costs only a few dollars and will last you for years. Simply paint some patches with white glue, sprinkle on the rubble, and let it dry. Next up we start painting and turn this mess into terrain!